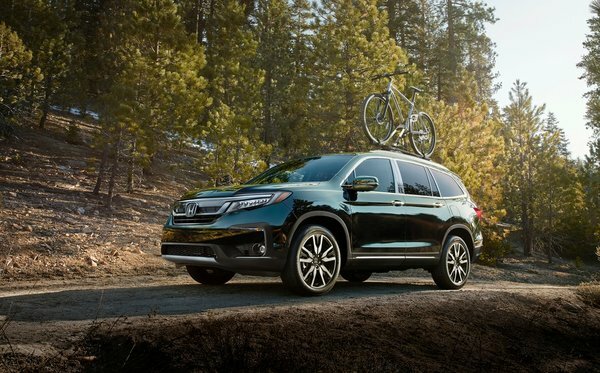 For the 2019 model year, the Honda Pilot is entering its fourth generation ready to take on the toughest competition in a heavily packed SUV segment that’s rife with well-appointed and beautifully designed vehicles. Most notable for the 2019 Honda Pilot is a Canada-exclusive trim level Honda calls the Black Edition. This particular trim level features gloss-black accents, darkened headlights and taillights, black wheels, and inside red ambient lighting as well as red accent stitching throughout the interior. In terms of other design elements that have evolved on the 2019 Honda Pilot; the front grille has been redesigned and features a new bumper as well. Available multi-element LED headlights, power-folding mirrors and 20” wheels can be added on the Touring edition (and the Black Edition). Besides being a serious head-turner on the road, the 2019 Honda Pilot does more than look good, it’s also extremely practical and remains one of the few three-row SUVs currently available on the market. There’s room for up to 8 inside the Pilot, and access to the third row is made extremely easy via Honda’s available One-Touch Walk-In feature. Other notable interior features include an all-new fully digital gauge cluster display, as well as (for the first time) a wireless charge pad. The 2019 Honda Pilot also features Apple CarPlay and Android Auto capabilities, and also has an available tool every parent will rejoice in using: a kid-friendly app called “How Much Farther?” The app works in conjunction with the onboard navigation and keeps the kiddies informed as to how much distance is left via a fun graphic displayed on the rear entertainment system. In terms of engine choice and power, the 2019 Honda Pilot remains powered by the outgoing 3.5L V6 mill that produces 280 horsepower and 262 lb-ft of torque. The standard 6-speed automatic remains across the board, unless you opt for the Touring model in which case you will find an updated version of Honda’s 9-speed automatic transmission that was revamped for quicker, smoother shifts while driving. 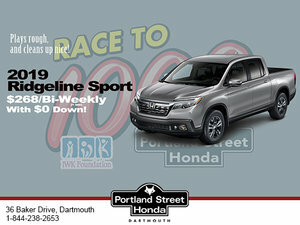 To find out more about the newly designed fourth-generation 2019 Honda Pilot, head down to your local Portland Street Honda dealer to speak to one of our experts about everything this stylish SUV has to offer, and don’t forget to book a test-drive, too.